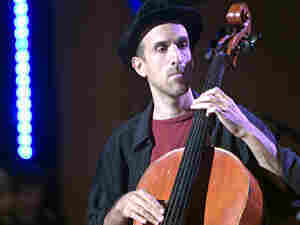 Rufus Cappadocia, Bowing a Globetrotting Cello When classical music could no longer contain his ambitions, he turned to Middle Eastern music, flamenco and Jimi Hendrix for inspiration. And when his cello couldn't keep up with his new ideas, he gave it an extra string. Click here to watch a video of Rufus Cappadocia performing. Musicians speak to us with their music, and Rufus Cappadocia is no exception. The moment he began speaking with me from NPR's New York studios, it was clear that his cello was going to be doing a lot of the talking. Cappadocia has always been a nomadic soul, and his various paths led him to become an unusual sort of cello virtuoso. Growing up in Hamilton, Ontario, he discovered the cello at the age of three. He later pursued traditional classical training by attending McGill University in Montreal — and came to the first crossroads in his career. John Coltrane, Jimi Hendrix, B.B. King and the records in the college's ethnomusicology library expanded his vision, and he found the strictures of classical music too much to bear. "As long as I was playing for my teachers, I was fine to play the classical music, because that was their language that they spoke and we spoke this together," Cappadocia says. "The minute that I actually got up on stage and had to start representing myself, it just didn't feel right." He also felt that the cello itself wasn't fully able to express the music he was feeling. So he modified it. Adding a fifth bass string and pickups gave him the flexibility to play in many settings with other musicians. Cappadocia wound up traveling around Europe, busking for change, and he eventually landed in Seville, Spain. While struggling to hold his own with local street musicians, he developed his own flamenco-style technique for bowed cello. "So I was on the street, and the gypsy guitar players [are] coming up to you, and they, you know, man — 'Joder, hombre, tio, dame la musica!' — so you better play something to make them happy," Cappadocia says. "And that was sort of me being a flamenco guitar player." Cappadocia draws on the similarities between seemingly diverse music forms such as blues, Sufi, Middle Eastern and even Gregorian chant. To him they are all compatible, microtonal modes of music. "I've been blessed to work in all these different lineages," he says. "And they just sort of somehow naturally assimilate in my instrument. And also because I'm playing a unique instrument, it lends itself incredibly well to speaking all these different languages." To him, even Jimi Hendrix and classical Persian music have a lot in common. "It's not just similar — it's the same stuff, man," Cappadocia says. "And you really see it on the cello, 'cause it's all there."